Make sure your mower blades are sharp. Dull blades tear or rip the grass instead of slice it cleanly. When grass is wounded like this, it is slower to heal and is an open invitation to insect and disease organisms. Dull blades cutting wet grass makes the shredding even worse. 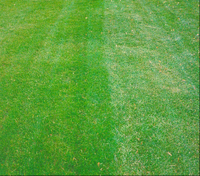 You can tell when a lawn has been cut with a dull mower because the top of the grass has a white or gray look to it due to the shredded tips, like the lawn on the right side of the picture. You can actually see this easier from the street than when standing in the middle of the lawn. Inspect your blades occasionally for nicks. We all hit stones or branches now and then. File them out if you can. Sharp blades give a clean cut and that puts less stress on your mower engine. Start the season with a sharp blade and if your lawn is a good size, have it sharpened (and balanced) again before the fall. Keeping an extra sharp blade around to use while the other is being sharpened is not a bad idea. Keep the underside of the mowing deck clean. Check it before mowing. Moist grass has a tendency to stick and clump up under the mower deck. When it gets thick it affects the ability of the mower to lift up the grass, resulting in a poor cut. You can scrape off the grass with a putty knife, flat stick or whatever is close at hand. I use a hand weeding tool. If you are mowing really lush or wet grass, you may have to stop and clean underneath mid-mowing. Unhook the spark plug first or at least make sure the mower has been stopped for 5-10 seconds before putting your hand under it! To get under the deck you are going to have to turn the mower on its side. Make sure you do this in a way that doesn't spill oil or gas out. And be careful doing anything around sharp mower blades. Wear gloves. Put them on before you mow. Clear off any sticks, stones etc.. before you mow. Aside from dulling the blades, stones or wood chips can fly out of a grass chute and cause a lot of damage. Make sure you know where any potential obstacles like vent pipes, above ground tree roots etc.. are hidden in the grass. Know your mower – in particular, where the the blades are in relation to the deck, wheels and ground . This way you can safely navigate around the obstacles in the lawn without damaging them or the mower blades. You can also avoid "scalping" the lawn if you know where the blades actually are. Scalping of the lawn happens when the blades cut far too close to the soil line, way below the height the grass can withstand. Usually this results in either dead grass, weeds, moss or a combination of the three. Most scalping occurs on high spots (or bumps) on the lawn, or they occur where the lawn meets the drive or sidewalk and the soil is a little high. 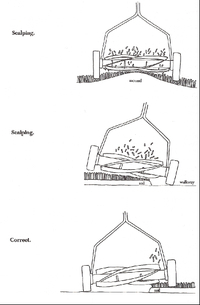 Here is an illustration taken right out of my book Building A Healthy Lawn: A Safe and Natural Approach. You can see in the top drawing how the wheels of the mower sit on both sides of the high spot resulting in a scalp. The mower would have to be moved a few inches to either side to avoid this. The second drawing shows how the point where the lawn meets the walk gets scalped. This happens when he soil under the grass is higher than the walkway and the mower wheel is positioned on the walk but close to the grass. You can see that the mower and the mower blades are at an angle, cutting down into the corner. The way to fix this is to simply move the mower wheels further out into the walkway, lessening the tilt of the mower and thus keeping the blades higher at the edge of the lawn. You might only be cutting 5-6" of grass on this pass but no scalping will occur. The third drawing (which should have been flipped around to have the grass on the left side of the mower) illustrates this pretty well. You may think that scalping the edges of the grass this way makes the grass look neater, but the grass will eventually die off, and then weeds or moss will replace it. Avoid mowing a wet lawn whenever possible. It gives a poor, uneven cut unless you have a really strong vacuum effect on your mower. It also tends to result in a shredded cut, rather than a clean slice. Always make sure your grass is standing straight. Grass that is standing upright will give you the cleanest cut that stays looking good the longest. If you cut a lawn that is leaning (due to wetness, being too long or mowing too much in one direction) it will cut poorly, and may even lean more when you are done. Sometimes a mower with a very strong vacuum can straighten up a wet or leaning lawn, especially if you mow against the way it is leaning. A light raking in the opposite of the direction of the way the lawn leans will lift the grass upright and make for a clean cut. Alternate your mowing pattern frequently. If you continually mow in the same pattern you will get tire ruts and perhaps a wavy look to the lawn. Try reversing or going in a perpendicular or diagonal direction to the way you normally cut. As mentioned above, grasses that lean in one direction can often be lifted back up by mowing in the opposite or a different direction. Keep the discharge chute unclogged so clippings can shoot out easily. Damp grass, or too much grass cut at once, will clog up the shoot especially if there is a grass catcher set-up. Never clean the discharge chute when the mower is running. You are asking for trouble. Shut the mower off. Unhook the spark plug. Of the 50,000 people that go to the hospital yearly for lawn mowing injuries, cleaning the discharge chute while the mower is running is probably the most frequent reason cited. Watch where your clippings are going (if you aren't bagging or mulching them). If you have a side discharge chute on your mower, you need to know where the clippings are going. You normally don't want the clippings blowing into your beds or all over the drive and walks even if they are cut pretty short. Also, you don't want to create a buildup of grass clippings that gets too thick to mow over. The easiest way to mow when concerned about clippings is to go around the perimeter of the lawn a 3-4 times moving inwards with each cut, having the discharge chute facing towards the inside of the lawn, away from the beds. Then, when you think it is safe to do, reverse the direction and start throwing the clippings outwards towards the bed, but not reaching into them. This is just one way to do it. Because you should be changing mowing patterns frequently, you'll have to do a little thinking beforehand. Keep your lines straight when mowing. This gives the lawn a nicer look than having the tires make wiggles all over the lawn. Also, don't run the tires of the mower in the same groove that you made on your last pass. This can create tire ruts and lines of grass being pressed down by the wheels but not cut. If the grass springs back up you can get skinny lines of higher grass appearing on the lawn. Always overlap the tires by at least a few inches to make sure all of the lawn is getting cut. Don't force the mower when the grass is thicker, taller or wetter. It will result in a very poor cut. When you are mowing, you can get a feel for whether the mower is cutting the grass easily or if it is straining. When conditions are tougher, slow down a bit. Shut the self-propel function off if necessary, and take your time over the really bad spots. You can also mow less with each pass when the grass is too thick. Cut the mowing width of your passes by a third or even a half when conditions warrant it. Be very careful on hills or steep grades, or don't mow them at all. You really don't want to slip and have a foot or other body part go under the mower. Controlling a mower going down a hill is not easy even in perfect conditions. Never mow hills when they are wet. You don't want to be another mowing injury statistic. If the slope isn't too bad, mow side to side when the grass is dry. If it really isn't a safe slope to cut, consider putting in ground cover. Don't allow children to mow the lawn until they are physically strong enough to control the mower, and to understand these mowing tips. These tips all apply to riding and reel mowers as well. We'll discuss the pros and cons of the different types of mowers later on. Stuart Franklin is President of Nature's Lawn & Garden, Inc. a lawn care service company and internet product store located in Western NY. All articles on this site are copyrighted and may not be used without permission from the author.